For over a hundred years, property owners have relied on Auth-Chimes for high-quality, maintenance-free door enhancements. Florence's time proven design, quality materials and acoustically buffered strike pads work harmoniously to create a rich and distinctive two-note musical tone that is always pleasant to the ear. Florence's models allow your residents to see out, while preventing unwanted visitors from seeing in. And, because Florence's chimes are not dependent upon electricity, you never have to worry about power failures, worn batteries, or frayed wires. Florence Manufacturing continues this proud tradition of exceptional design, unmatched durability and affordable elegance. 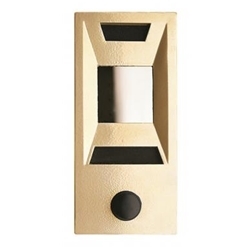 Features heavy cast metal with a gold powder coat finish. Includes a deep recessed viewing mirror that fits doors 1-1/2" thick with supplied studs. Includes Apartment Identification and Name Plate.